An overnight campsite/resting point on mt. Kilimanjaro, located near the base of Barranco wall. 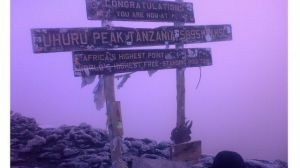 It is used exclusively by climbers on the Machame, Umbwe, Shira and Lemosho routes on their way to the summit, as the descent from the mountain takes a different route. 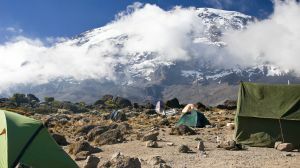 Barranco campsite has no cabin accommodation, meaning all of climbers who use it sleep in tents that are carried up the mountain by porters. There is however, a ranger's hut at the northern end of the campsite and near the wall, where climbers are required to check in on arriving at the campsite. The toilets are located inside one building at the centre of the campsite, a few W.Cs — some of the few available on the mountain as other campsite use pit latrines. What to do thereHiking, camping, picnics. Best time to visitJuly to February, when its warmer and less likely to rain. 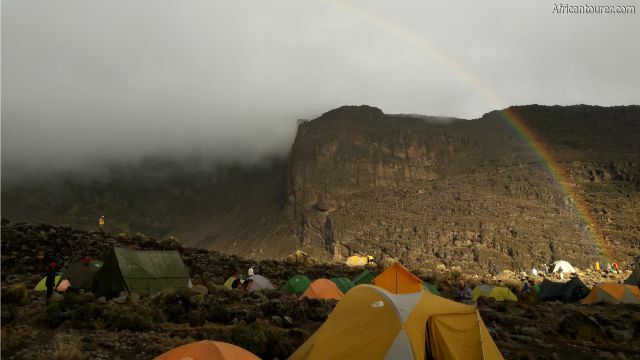 Barranco campsite is located near the base of Barranco wall, south of Kibo — one of Kilimanjaro's three peaks. It is also near the edge of the moorland zone, giving the area enough rainfall and humidity to keep the plants and animals going. The campsite also lies in a valley, with the Barranco wall on the east, a hill to the west, Kibo to the north and a valley south, giving it some protection from high winds. The next campsite after this is Karanga hut. Are you associated with Barranco campsite? Contact us to improve this page or create another page for your business.